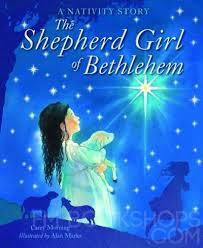 S hepherd Girl of Bethlehem: A Nativity Story Carey Morning, illustrated by Alan Marks (Lion Press) $14.99 Lion Press (from the UK) does some of the very best children’s books of Bible stories available and this is a lovely, delightful, and at times moving story that invites every reader to enter the stable in Bethlehem and discover the the meaning of the Light — accomplished by following the work and faith of a simple shepherd girl, the daughter of one of the shepherds of Biblical fame. The pen and ink with full color watercolor is used expertly, with tender expressions on the faces of the people and animals, bringing us all close to this rural setting of caring for sheep, seeing those angels, visiting that manger. Biblical and Middle Eastern scholars will fuss that the manger wasn’t quite like a North American barn with hay and such (and surely the wise men didn’t show up that night) but this tale still captures something very, very true about this wonderful night. I love this book, for its fine telling of the story and the excellent artwork! 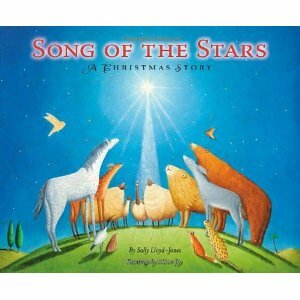 S ong of the Stars: A Christmas Story Sally Lloyd-Jones, illustrated by Allison Jay (Zonderkidz) $15.99 I hope you know of our fondness for the truly exceptional Jesus Storybook Bible (where “every story whisper’s Christ’s name”) and Thoughts to Make Your Heart Sing, the book of devotions which serves as a sequel, both by Lloyd-Jones; we have described often why we think they are so, so good for the very young and those in the earlier years of elementary school. This splendid, artful Christmas book has a very different sort of artwork and cadence, but the gospel-based, theological insight and the joyful mood remains. As you can guess, this works very well for those teaching the true Biblical story of God’s redemptive plan for the whole (groaning) creation — a necessary emphasis to counteract personalistic, pietistic renditions of world-flight Christianity or mere sentimentality. Yessiree, here, the whole creation gets in on the act, and it evokes wonder and praise! It is majestic, but still playful and fun; what child doesn’t like hearing about the animals praising their own Maker? Fantastic! Very highly recommended. T he Animals Christmas Elena Pasquali, illustrated by Giuliona Ferri (Lion Press) $14.99 I celebrated this book last year, also, and most of us agreed it was one of our favorite Christmas kids books of 2012 — so I just had to list it again. As with many other Lion Press books, the artwork is commendable, colorful and modern, neither silly nor sentimental. As you might guess, this shows the various animals that were part of the Christmas story, and how the Bible points us to the hope of a renewed creation, where all creatures play a role in the unfolding of God’s redemptive work. One parent in England wrote that The Animals Christmas is “filled with gorgeous, sumptuous pictures full of mood and emotion and with beautifully drawn animals…a really beautiful book.” If you hear Isaiah 11 in your church – and I hope you do! — then this book will be great to read with your little ones. 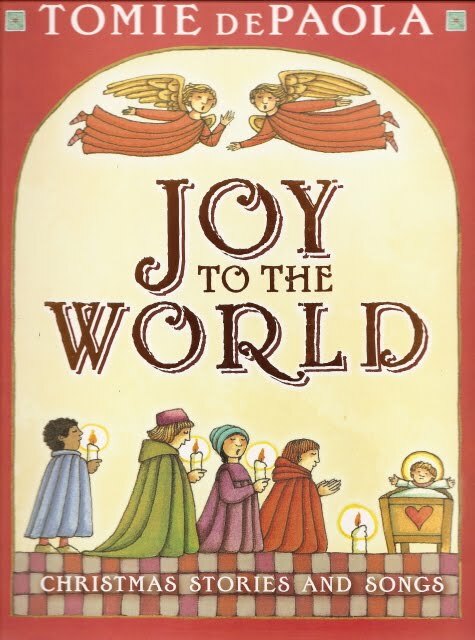 J oy to the World: Christmas Stories and Songs Tomie DePaola (Puffin) $12.99 This is the Tomie DePaola book I’ve been waiting for — a nice, paperback compilation of three of his best Christmas books, The Night of Las Posadas, The Story of the Three Wise Kings, and The Legend of the Poinsettia. As Publisher’s Weekly put it, reviewing Night… these is an “exquisitely wrought story…dePaula’s talent for crafting folk-tales is honed to near perfection, and his pages glow with the soft sun-washed hues of the Southwest.” As with his other books, the artwork is the heart of it, even though the text is nice — from his use of Byzantine and Romanesque art styles to his playful colors which are bright without being gaudy, to his symbolic touches which consecrate the glory of the everyday, we love his illustrations. 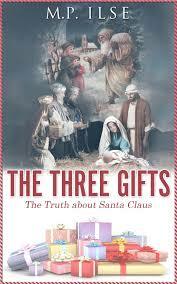 T he Three Gifts: The Truth About Santa Claus M.P. Ilse $5.99 I happen to know the wonderful local woman — M.P. Ilse is a pen name, I guess — who wrote this, mostly out of a desire to share her research about Saint Nicholas with her own kids and other interested folks. (It started with the common question faced by parents — is Santa Claus real?) There are a few other books on this topic for younger children, and a few that have some schtick to them, clever, but not too factual. This is just a simple little paperback with clear type and clear-headed facts about the goodness of the original Saint Nicholas (born in Lycia, AD 280), his service to others, and how he can be a model to us to be “the hands and feet” of Jesus’ love. It presents with clarity the gospel of Christ (and how the St. Nick tradition morphed into Santa Clause.) Perfect for curious middle schoolers, or anyone who wants a quick summary of this fascinating chapter of church history. 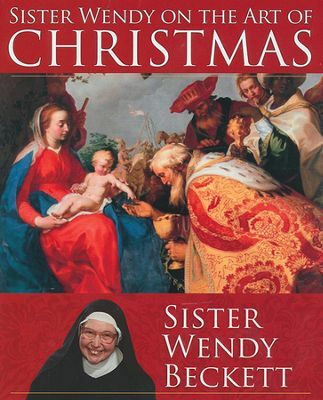 S ister Wendy on the Art of Christmas Sister Wendy Beckett (Franciscan Media) $14.99 Sister Wendy is a fine art historian and has served us well with many books explaining the religious significance of many art pieces, both overtly Christian and otherwise. In this slim paperback she teaches us both about the Advent and Christmas season and about specific art works and icons that illustrate the Biblical episodes that are commonly considered this time of year. Fourteen wonderful paintings are gloriously reproduced and she “seamlessly draws out the intricacies of artistic technique and meaning.” By the way, following the church calendar, she has a painting and entry for Epiphany, Baptism, Wedding at Cana, Transfiguration, and the Presentation of Jesus at the Temple. This is not really for children, but her helpful explanations are suitable for the whole family. Very, very nicely done. 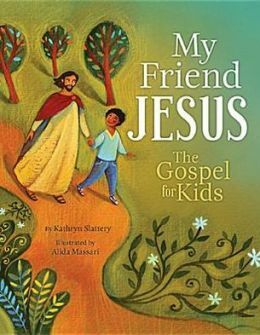 M y Friend Jesus: The Gospel for Kids Kathryn Slattery, illustrated by Alida Massari (Tommy Nelson) $12.99 Oh my, this is great! Slattery’s simple overview of the life of Jesus, ending with an invitation to children to accept Him and know of his saving love and constant friendship, is simply wonderful. (Years ago, Madeleine L’Engle said it was “One of the best books of jesus for young people I have encountered.) In this new edition it has been given not only a handsome, slightly padded cover, but exquisite artwork by the famed European artists and children’s book illustrator Alida Massari. There is a nice place in the front to inscribe the child’s name, making it a great little gift book about Jesus, his birth, life, death, resurrection, and promises. 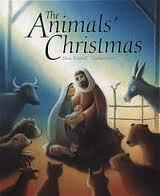 Many other books that attempt to introduce Jesus to children are not as well written, nor as artfully designed. Very, very nicely done. 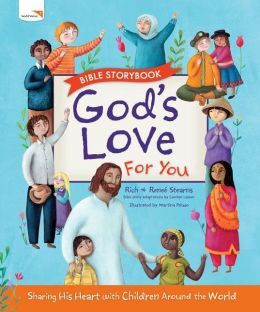 G od’s Love for You Bible Storybook Rich & Renee Stearns with Carolyn Larsen illustrated by Martina Peluso (World Vision/Nelson) $19.99 My favorite new children’s Bible, one of the best in years, has three or four great things going for it. Firstly, it tells the Bible stories, well, creatively and clearly; the Stearns know the Scriptures well and their love for living into the Story of God is evident, with the good news of it all front and center. (On the front of the book it says “Sharing His Heart with Children Around the World.”) Secondly it does have this global aspect, with lots of sidebars, delightful photographs of multi-cultural children, and full-page artwork about other countries, using maps and cool graphics showing kids in other parts of the world, both those who are obviously needy, and those who are less so. It is mostly upbeat and informative, a nice touch to remind us that God’s work in the world is certainly not exclusive to North American middle class kids. Most youngsters will love these sections (including the neat pictures of animals and homes from around the world.) Thirdly, I just adore the artwork, with soft, full color illustrations that capture a perfect balance of winsome and realistic, contemporary and creative without being overly eccentric or off-putting. Ms Peluso is a very talented artist and the overall design of the book is remarkable. God’s Love for You Bible Storybook is very highly recommended. 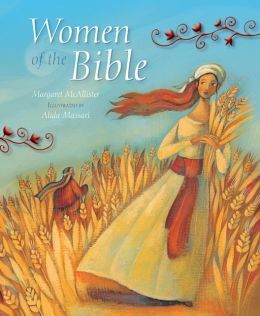 W omen of the Bible Margaret McAllister, illustrated by Alida Massari (Paraclete) $16.99 This is truly one of the most exceptional children’s books of the year, a great combination of quite colorful writing — for older elementary even up through middle school, I’d say — and colorful artwork and design. The illustrating artist grew up in Rome and studied at a prestigious European art school and the creative stylings, tinged with classical hints, are wonderful to carefully behold. Here we have stories of ten women of the Bible (including, of course, Mary of Nazareth and the Christmas story) all told in the first person, from the point of view of the woman herself. These monologues bring such a fresh perspective to some common stories (and a few of the stories are rarely touched in books like this.) There is some literary license, making it really, really interesting, especially for those who are a bit older; I could see this being read aloud in adult programs, too. The one about Mary, by the way, is very creatively rendered (she recalls parts of her life by showing items she has kept in a box as mementos) and you are sure to enjoy it this time of year. 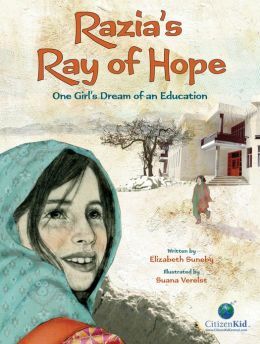 R azia’s Ray of Hope: One Girl’s Dream of an Education Elizabeth Suneby, illustrated by Suana Verelst (Kids Can Press) $18.95 We stock all of the Kids Can Press “CitizenKid” collection, and have featured several before, from One Hen to Mimi’s Village, The Good Garden to If the World Were a Village. We love them all! This new one is based on a true story about girls education in Afghanistan, and it captures the yearnings and joy of a child who gets to go to a newly built school. This book is stunningly illustrated in a mixed medium style, with sophisticated, realistic watercolors combined with quilting that wonderfully captures the stark beauty of this complex land and the glories of the Afghan people. (The cover art doesn’t do it justice — it is very, very wonderful to look at.) Ms Suneby was inspired to write Razia’s Ray of Hope after meeting Razia Jan, the founder of the Zabuli Education Center near Kabul, and hearing the student’s stories. 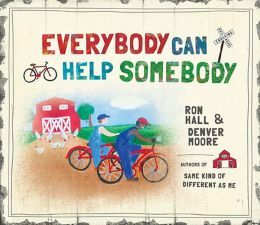 E verybody Can Help Somebody Ron Hall & Denver Moore (Tommy Nelson) $14.99 Perhaps you know the fabulous story, a memoir called Same Kind of Different as Me and its sequel, Same Kind of Different as Me, about a homeless man, an art dealer, a gospel mission, and a grand reconciliation that is being made into a Hollywood movie. This new children’s book is by those two same guys, one white and one black, telling the basic plot of Denver’s story, illustrated with his colorful “Grandma Moses” style of folk art. Denver loved children, and wanted to do a children’s book which was fortunately completed before his death less than a year ago. A truly wonderful story, with colorful paintings, too. Yes, we can all make a difference, everybody can help somebody. 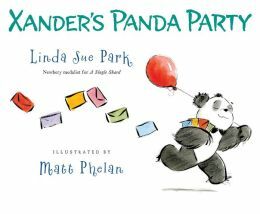 X ander’s Panda Party Linda Sue Park, illustrated by Matt Phelan (Clarion Books) $16.99 Don’t let the underwhelming cover allow you to miss this wonderfully fun, very well-written, and cleverly illustrated picture book for younger elementary ages — it deserves the attention it is getting. (Ms Park has already won a Newberry medal for a book for older readers she did called A Single Shard.) In this book, a Panda bear at a zoo draws up an invitation for a bear party and is momentarily perplexed when the Kuala bear reports that he is not really a bear (but a marsupial, technically.) Is he still invited? Well, the invitations are redesigned and the party is now for bears and other mammals, and you can imagine what happens next, when, one by one, birds and reptiles and… well, you’ll have to read it yourself to see how your child or grand-child reacts to the lovely story of expansive generosity and hospitality. What fun! A great follow up to the “no room in the inn” references you will surely here in the upcoming weeks. 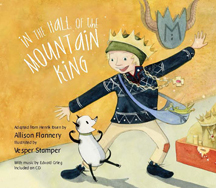 I n the Hall of the Mountain King Adopted from Henrik Ibsen by Allison Flannery, illustrated by Vesper Stamper (with music by Edvard Grieg included on CD) (Samizdat Press) $22.00 From a wonderful indie press comes this spectacularly cool project, a playful and modern book illustrating this classic symphony — with a CD enclosed! Kids will love this classy, if slightly off-kilter adaptation, and will come to appreciate the music, and ponder the lessons of the play Peer Gynt, upon which it is based. Flannery is a music-loving, story-telling kindergarden music teacher from Colorado and Vesper Stamper, a graduate of the prestigious Parsons School of Design (and one half of the Ben + Vesper indie rock duo) is a visual artist from Jersey City, NJ. Kudos to Samizdat for releasing such an interesting project, and going the extra mile to get the CD enclosed. 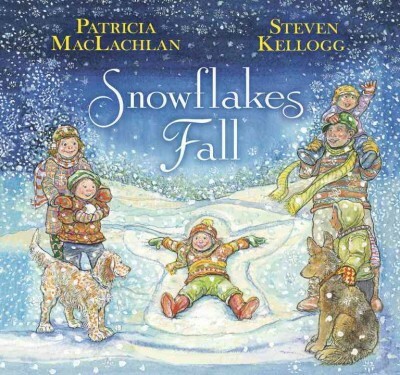 S nowflakes Fall Patricia MacLachlan and Steven Kellogg (Random House) $17.99 Many of us have appreciated the colorful detail of Kellogg, but here he shines, and for a beautiful, beautiful reason: this book, without saying so in the story itself, seems a tribute to the children killed at Sandy Hook, and some of the publication’s proceeds go to the Sandy Hook Schools Support Fund. This lovely, happy book shows kids playing in the snow, celebrating the joys of winter, and how each snowflake is special. “No two the same — all beautiful.” There is the hint of loss as they talk about snow melting; the “starred review” at Booklist says, “This is a graceful homage to the inevitable seasons of life and remembrances of loved ones and times past. Whether or not they are familiar with loss and grief, children will feel the healing power of this hopeful, uplifting book.” Ending with the imprint of the 26 snow angels the playing children had made in the snow is heart-wrenching, if one reads it knowingly. Such a commemoration is tricky to do well, and this succeeds, movingly.